As George Michael once put it, you gotta have Faith. And, in this instance, we'd definitely have to agree with him. Excellent spec for the money. Great neck. Characterful tones. "The 'baby jumbo' tag might refer to the body contours, but physically, it's not unlike tucking an infant elephant under your arm"
Consider instead the fact that this entire guitar - top, sides, back, the lot - is made of solid spruce and mahogany. Factor in the smaller touches, like the elegant abalone rosette and the understated binding (plus an admirably neat-and-tidy Indonesian build job), and there's nothing to suggest this model is a poor relation. As chance would have it, this reviewer keeps a cheapo Faith Venus kicking around the house for drunken jam sessions, and is therefore well placed to judge whether it's really worth coughing up (a lot) more for the executive version. Our first impression: it's big. The baby jumbo tag might technically refer to the body contours, but physically, it's not unlike tucking an infant elephant under your arm. This is a whole lotta axe, with a top that's about 403mm (15.87 inches) at its widest, with a deep-pan 115mm (4.52 inches) rim depth and no cutaway. Really, the performance is saved by the smooth satin ride of the neck, which is a palm-filling, position-shifting winner and lets you focus on the tone. Ah yes, the tone. Our first impression: it's big (again). Even without a pick, there's a listen-to-me boom as you walk through arpeggiated riffs and stroke open chords, but ultimately, it's the character of the sound that really struck us. This model scores with its sunny-side-up jangle factor, which means that open chords - plus a skinny plectrum - truly shimmer and shine, while never negating the option to shift gears and deal out mellow, thumbed walking blues passages. This guitar sounds like the records, and by extension, would make an excellent studio guitar. 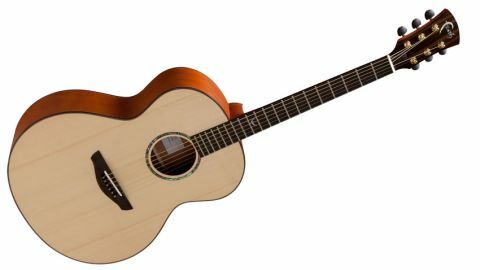 People sometimes liken more expensive guitars to overpriced wine, and argue they're all the same. They're really not, though, and this model is the proof.